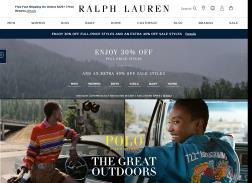 Ralph Lauren sells up-market, high-end luxury wear, fragrances, accessories and furniture. The company has over 300 stores all around the world including 8 flagship stores in cities such as London, Miami and Milan. Shop & Save with New Styles Added to Womens Sale! Shop Select Sale Items priced under $50. Valid while supplies last. Get up to 40% Off Select Mens Sale Polo Casual Shirts. Offer valid for a limited time only. Further Markdowns Taken! Get Up to 50% off + Extra 30% off select styles. Offer valid from 01/04/2019 at 3:15 am PT. Celebrate You! Up to 40% off + Extra 40% off select Sale styles. Offer Valid from 12/25/2018 at 3:15 am PST.